Steve Solomon developed a fertilizer mixture specifically for our Pacific Northwest maritime climate. It is best to buy each ingredient in bulk, as it is cheaper over time than buying small boxes of fertilizer. Store in metal galvanized garbage cans and keep moisture out. ½ part lime in equal amounts of agricultural lime and dolomite. Leave out the lime for acid loving plants such as rhododendrons. ½ part phosphate rock or bone meal (for vegetarians phosphate rock would be the obvious choice). You won't need to be precise when measuring this out. The seed meal and lime are the most important ingredients, and as you build your supply of fertilizer, you can add the latter ingredients as you can afford them. 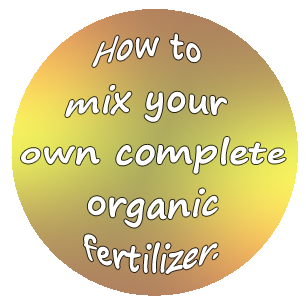 You can mix them all at once or store them separately and mix what you need as you use them. For many of the plants listed in the Plant and Gallery Guide, I recommend using this formula. 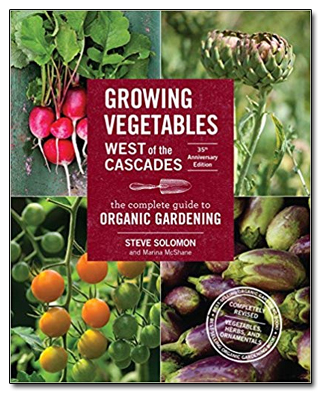 I highly recommend the book Vegetable Gardening West of the Cascades The author, Steve Solomon, developed the complete organic fertilizer recipe. Even if you garden strictly with ornamentals, this book will help you understand our climate, cold spring soils, and what our plants need for year round health. Solomon goes into detail about our soil structure as well as the need to fertilize specifically for our unique situation. 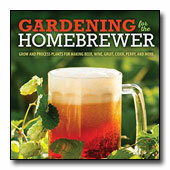 A must read, in my opinion, for gardeners in the maritime Pacific Northwest. Book Description: Here's a fully revised edition of this regional bestseller- considered to be the definitive food gardening manual for the Pacific Northwest. This is the bible of vegetable gardening for anyone turning the soil west of the Cascade Mountains-from Western British Columbia to Northern California. It includes the basics of soil, when best to plant, the art of composting, what varieties grow well here, which seed companies are reliable, information on handling pests, and an extensive section on the cultivation of each vegetable.